Riutzel » Roger Perron Inc.
We found Roger Perron’s website and liked his portfolio of work, as well as his background and large amount of experience. Roger met with us several times in order to get into our heads and find out the types of design ideas that would make us excited about our kitchen. He was very willing to listen and hear us out. The architect we were talking with was from a city much further away than Roger and we were going to have to interview all the different tradespeople including the architect, electrician, plumber, carpenter, painter, etc. The great thing about Roger is that he’s turnkey and handles it all, including the design, which removes some big headaches from the owner’s job. He has his whole team already in place and trusts the quality of their work. My wife cooks and loves to read recipes. She has even been to Italy twice to take cooking lessons. A woman in her kitchen is a big deal! We have been involved in all the steps of the remodel. The kitchen turned out to be a dream kitchen – we love it! Roger has worked to get to know us. He has worked to meld his creativity and experience into what we wanted. We wanted an old-world look, but light. He blended a modern design with old-world touches. We have all the newest appliances, in a classic, old-world setting – all blended perfectly together. 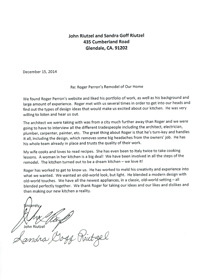 We thank Roger for taking our ideas and our likes and dislikes and then making our new kitchen a reality.